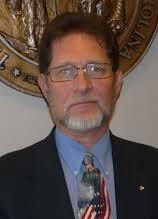 Meet NC House member Larry Pittman, who represents Cabarrus County and who lists "Pastor" as his main occupation. He might want to brush up on the Sermon on the Mount, given the way he's emailing really nasty trash-talk. He recently went after Planned Parenthood like a mad dog, saying that it "deals out nothing but deception, death, personal devastation, and moral degradation. Never will I agree to give that bloody, indecent, immoral organization one penny. I will not be satisfied until it is outlawed." The "not one penny" is in reference to the new Republican majority in the NC General Assembly and their decision to cut off all funding to an organization that provides over 18,000 tests for sexually transmitted infections, over 11,000 life-saving breast and cervical cancer screenings, and contraceptive services to more than 61,000 women every year in North Carolina. With informed government officials like Larry Pittman, the North Carolina Republican Party is sufficiently stocked. Thanks for bringing Larry Pittman's actions to the forefront. Have to love how politics # 1 concern is hiding who they truly are. Thanks for bringing some of these antics to light! I'm alive today because of Planned Parenthood. Not that this man would care. Some people just can not be happy unless they fell like they are imposing their personal thoughts on how things should be upon others.